Run by a husband and wife team this restaurant specialises in French cuisine from the south of France, but they also have a gluten free meal option and the menu changes daily, depending upon the market produce available at that time. 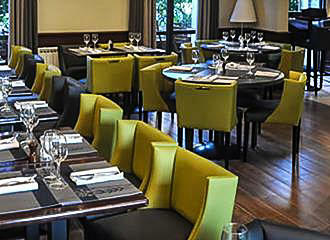 Located in an area where there are numerous different tourist attractions in Paris to visit, whether you wish to experience one of the many museums or have a night out enjoying the theatre, then this is a great place to enjoy French cuisine with friends or family in a warm and inviting atmosphere. You will find the main dining room pleasantly decorated with warm tones including salmon coloured dining chairs, light walls and dark wood cabinets and floors, which complement each other superbly, yet another area is more vibrant in a deep yellowish colour with wicker chairs. 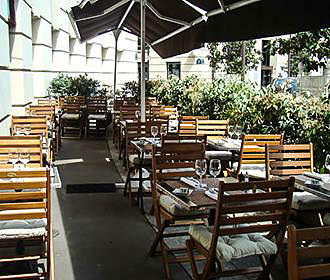 Then you have the bar area with its high wooden or leather chairs and tables set on a stone floor, not forgetting that there is an outside terrace for warmer months, which looks over to the fountain at the Place de Catalogne, plus there is a private room available for functions and small parties of up to 16 people. 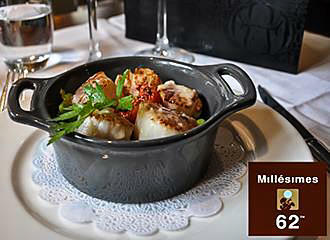 And since June 2007 Millesimes 62 has been run by a husband and wife team of catering professionals who are passionate about French cuisine and providing a friendly welcoming atmosphere to all its patrons, with background jazz music playing for a relaxing meal amongst friends, colleagues or family. 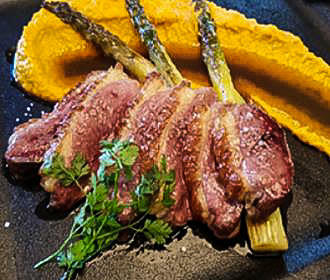 You will find traditional French cuisine with a Provencal touch presented at Millesimes 62 restaurant with different formula menus available in what they class as market cuisine, due to the fact that the menu changes daily depending upon what fresh produce is available. The first option is the Formula in the Bar, which is only served at noon and for €16.50 as of 2014, it consists of one main course with a glass of wine or mineral water and a coffee. Yet there is also a Market Menu with a starter and main course of main course and dessert for €20 or all three for €25, and this changes daily. However, for both lunch or dinner you could opt to go for the a la carte menu, which is a cost of €27 for a starter and main course, or main course and dessert, yet a three course meal on is only €30. And for this same cost as of 2014, there is also a Gluten free option, or you can just choose a main for €19. Yet, there is a Prestige Menu available which includes an aperitif, starter, main course, dessert, wine and coffee for €39 per person. Some of the delights you may be able to experience include starters such as Crispy goats cheese and tapenade, Pressed shrimp guacamole and espelette, Warm asparagus and bacon, Norwegian salmon tartare, etc. Main dishes could be Tuna steak with caramel soy, Salmon escalope with maple syrup and basmati rice, Beef tartare or Chicken Supreme with honey and spices, then you could opt of a cheese plate or one of the tempting desserts like a cheesecake and red fruit coulis or Lemon meringue pie. But as we have mentioned before, what we have mentioned may not be on the menu when you go, as the choices of dishes changes every single day, and this is only a small selection. Yet some plates and starters do carry an additional supplement like the Foie Gras starters or the Seared beef tenderloin for a main course. You will find that this restaurant in Paris is open on a Monday to Friday for lunch from noon until 2.30pm and of an evening for dinner from 7pm through to 10.30pm, but they are open on a Saturday evening from 7pm through to 11pm. However the bar is open from 8.30am to 3pm and then from 7pm through to 10.30pm on a Monday to Friday, and closes slightly later at 11pm on a Saturday. Yet the bar and restaurant are closed on a Sunday. It is located in the 14th Arrondissement on Place de Catalogne, plus you may be also pleased to know that Millesimes 62 is accessible to the disabled, plus your beloved pets are allowed if they are kept on a lead and under control. And when it comes to public transport, the nearest Metro station is the Gaite stop via line 13, but the bus numbers 88 and 91 will get you close by, plus the Noctilien night bus service also has a stop nearby. And this restaurant is also situated close to the Gare Montparnasse train station, which provides major links to other destinations in France and Europe.